Living alone, I don’t get to say “goodnight” very often, except to ghosts. But for one night every year, just before summer begins, I get to say it over and over again at Ithaca’s Hospicare and Palliative Care Services’ annual Illuminations, an evening of remembrance and community. Five years ago I asked about volunteering for this event. Having a job to perform makes it easier to attend parties and gatherings, especially as a bereaved mother prone to bursting into tears. No one had filled the spot on the volunteer sign-up list requesting a Goodnighter. “Say goodnight to guests and thank them for coming,” the job description read. I could do that, I thought. The first year, I was so nervous about approaching people that I forgot how easily I could fall apart upon hearing Christmas carols or smelling cucumber-melon body-spray. But I strolled through the gardens where hundreds of lit candles inside white paper bags lined the walkways, and found the ones labeled with my father’s and daughter’s names. Balancing a glass of wine and a plate of fresh fruit and cheese on my lap, I sat through the program of live music and poetry. Then it was almost dusk, time for floating candles on the pond. And Taps. Taps was my cue to start getting into place between the guests and the parked cars. There, I would chirp out my greetings to all the people as they left for home. No one had mentioned that a real live, very talented trumpeter would be playing Taps. Suddenly, I was stuck stock-still, standing in a hailstorm with my skin turned inside out. The sun was setting bright red and I felt like a duck shot down out of the sky. Somehow I recovered, remembering, I was the Goodnighter. I quickly took my station. And remembered my lines. “Goodnight.” And “Thank you for coming,” I croaked, in between gasping recovery breaths. My shaking stopped when people started saying goodnight and thank you, back to me. And when it was all over, and the last guests had gone, I fetched the luminarias with my father’s and daughter’s names, and knew I’d found my calling. So come say hello. Say goodnight to the Goodnighter. Goodnight is not goodbye. It is a sincere wish for your wellbeing. And it is my song of gratefulness. For a beautiful evening with people who understand love and loss. For feeling connected. For having the opportunity to say aloud, from my heart, goodnight and thank you. And to sometimes hear those words echoed back. 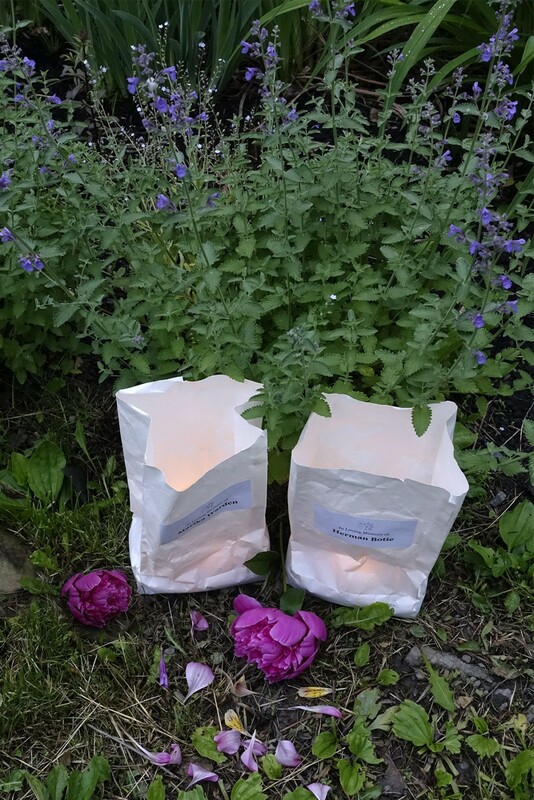 This entry was posted in 2018 and tagged bereaved mother, gardens and grieving, goodnight is not goodbye, gratefulness, grief triggers, hospicare, luminaria, Saying Goodnight, taps, volunteering at hospice on 2018/06/04 by Robin Botie. Thank you for being the goodnighter, Robin. I say good night to my pooch, but also miss the ritual of saying goodnight to humans. My hearing is so bad I didn’t go to Illuminations. I haven’t been there for a few years, but I will volunteer today and I’m always glad to be at Hospicare and support the work there. And now I’m experiencing what it’s like to have a family member as a hospice patient and feel all the support that extends to me. With love and gratitude–and goodday and goodnight. Good morning, Elaine. I’m so glad you’re getting that support. Having those pooches is very comforting but yes, it is not the same as human contact. We are so lucky to have our Hospicare. It is a welcoming place and even more than that, it brings us closer to seeing death as not so terrifying. A place that’s all about dying. And living, loving, supporting. I wonder when you volunteer there? Maybe that will be the place I finally find you again in person. Hugs and goodday. It is. Wish you’d come for this some year. you’d love it. I’m crying just reading about it. I’d be a mess if in attendance. Thank you for describing your experience. Well, you wouldn’t be the only mess walking around there, Monica, but generally the spirit of the whole evening is peaceful. Gratefulness seems to override grief there. But a good cry is always a good thing. Robin, thanks for your beautiful description of a night of illuminations at Hospicare. I’ve been there, and when those taps play . . . .
Did I already write about wanting to learn to play the bugle just so I could play Taps anytime I want? Seriously, Lynne. I can’t get enough of Taps.